Put all dry ingredients into your mixer bowl. In a smaller bowl, proof the yeast with the water and sugar. Let it sit while you do the wet berries. Process the wet berries ingredients in the Blendtec on the “Grind Grain” setting for 25-30 seconds or until completely pulverized into a very wet dough. Pour the wet dough into the mixer with the dry ingredients. Repeat the process for the wet berries again and pour contents into the mixer again. Add the proofed, spongy yeast mixture into the mixer. Using your dough hook, or in the Bosch, mix the dough for about 10 minutes on a low to medium setting. After 10 minutes, touch the dough. If it is very sticky, add a little sprouted flour until the dough does not stick to your fingers. There is just a fine line between very sticky dough, and slightly sticky dough. You’ll get the hang of it the more you do it. Take dough out and divide into 4 even balls. Roll out for each loaf. Place in a very well greased bread pan. Cover with a fine cloth, and let it sit a few hours to rise. Bake in a 350 degree oven for about 55-60 minutes. Nothing like hot bread out of the oven! Enjoy with some real butter. So you used both sprouted grains (2 cups) and sprouted flour (1-1/2 cups) per loaf in this recipe? Yes. 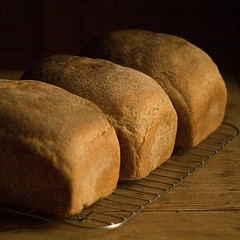 I have found the combination of the wet sprouted grains along with the dry flour to make the best loaf. Happy baking!